Outside of Pelé, few players have received as much praise and recognition from the soccer community as Diego Maradona. The Argentinian phenom was a magician on the field and remains one of the greatest soccer players in history, as well as one of the most infamous. Despite his up-and-down career, including his battles with drugs and several suspensions, most remember his on-field greatness and Diego Maradona cards and apparel continue to see considerable interest. 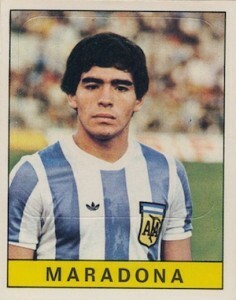 Shop for Diego Maradona Cards on eBay. Maradona played for multiple clubs during his career, setting several world record transfer fees along the way. 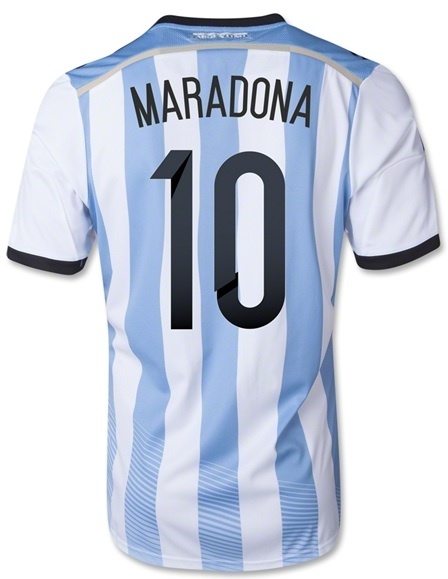 He also was a main fixture for the Argentina National Team. Despite stints with storied franchises like Boca Juniors and Barcelona, Diego Maradona spent the majority of his career with Argentinos Juniors and Napoli. He also played in four World Cups, including 1982, 1986, 1990 and 1994. Argentina claimed the 1986 World Cup Trophy and Maradona was immortalized with two goals against England in the quarterfinals that resulted in a 2-1 win for La Albiceleste. His first score was the "Hand of God" goal where Maradona punched the ball into the goal, and the penalty was seemingly missed by the referees. His follow-up score in the same game was voted "The Goal of the Century" in 2002. The team came up just short four years later, as Argentina was the runner-up to West Germany in the 1990 World Cup. Frequent comparisons are made between Diego Maradona and Lionel Messi. This is due to their similar playing styles, smaller size and shared Argentinian heritage. Card collectors don't have a lot to work with in regards to Diego Maradona cards. Most are low-end stickers and cards and there still has not been a major release of pack-pulled autographs for the former great. While the reverence for rookie cards is not as strong in the soccer collecting world, two of his earliest cards claim that distinction and hold the most value among basic Diego Maradona cards. 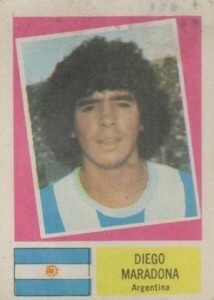 The first traditional Diego Maradona card came in the 1978 Figurita Crack Mundial. Maradona did not play in the 1978 World Cup because he was not included on the final roster, but the Argentinean version of the product still included him. The colorful sticker shows a young Maradona with an impressive head of hair. The "sticker" card has a blank back and like other cards from this era, actually needs to be glued into the album. Another early option for Diego Maradona, the 1979-80 release from Panini Calciatori is more common than the Crack card above. 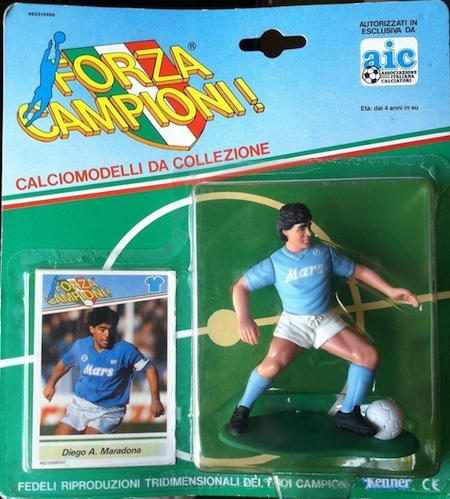 The sticker shows a much more serious Maradona and displays a more traditional look. 1982 Sorcacius Diego Maradona SGC 40 = PSA 3 Portuguese Issue of Argentina star! 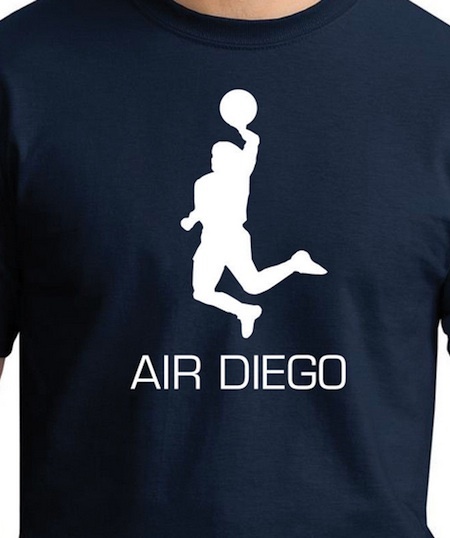 While there is not a ton of options among Diego Maradona apparel and memorabilia, collectors have some options. 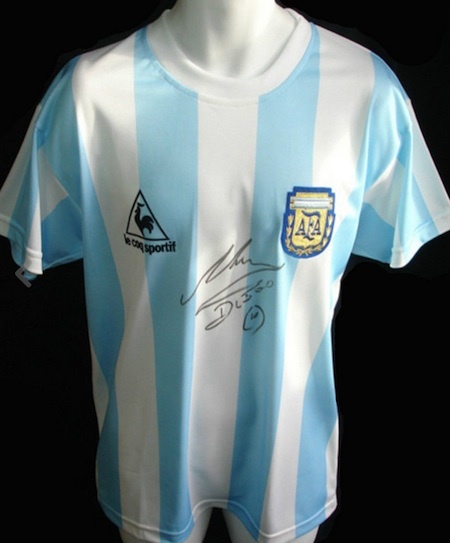 Check out the various apparel, jerseys, signed memorabilia and figures for Diego Maradona using the links below. There is actually one card issued earlier than the 1978 Crack: a disc-shaped card issued in 1977, when Maradona was just 16 and playing for Argentinos Juniors. The series was plainly named “Futbol”.